The primary protagonist of the series. With long, flowing hair and red eyes, she is a spiritual entity with a tragic past, who lives in a world of eternal twilight with her grandmother, and is the one who receives and delivers vengeance on her clients' behalf. She normally wears a black seifuku, or sailor uniform (which is usually worn during winter months), but always wears a kimono with floral designs when delivering the vengeance of a client. 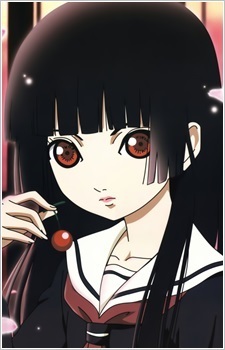 Ai started her career as the Hell Girl by her own act of vengeance on the villagers who sentenced her to a sacrificial death. Her eyes turned red arguably at the point where Sentaro (her childhood soulmate who gave in under the villagers' pressure to bury her alive) gave the first shovel of soil onto her face. She broke out of her grave after a while, and took revenge on the entire village with her wrath, burning it to the ground. Her task of fulfilling other people's vengeance and ferrying people to Hell is her punishment, a task which she has performed for the better part of 400 years. Although this task is presented as atonement, it is unknown whether she will ever be freed of it. Since she has done this for so long, she initially seemed to have become emotionless, numbed, as is shown by her expressionless face. Wanyūdō noted she still had feelings, though, although she did not express them strongly, and it was later revealed that Ai had been ordered to close her heart by the Spider. The experiences she has with the Shibatas reawakened her discontent with her terrible fate and later apparently reawakened other emotions, or at least Ai's ability to express them. When enraged, Ai demonstrates the ability to hurl great blasts of energy, as well as the power to create elaborate illusions and the ability to teleport. It is ironic that Ai's name actually translates as: Ai (love) and Enma (the Judge of the Underworld). A second translation of Ai, however, is accomplice, denoting Ai's role as Enma's assistant. Because her first name is never written in kanji, the actual meaning remains ambiguous. Anime demons and devils are arguably some of the coolest types of boys and girls in anime. Don't get in their way.